I’ve just finished reading the most recent of these, Barth’s Earlier Theology—and it’s a stunning work which offers profound insight into Barth’s relationship to the Reformed tradition. Webster performs close readings of four of Barth’s early texts (all of them based on lecture-series from the 1920s): The Theology of Zwingli, The Theology of the Reformed Confessions, The Resurrection of the Dead, and Protestant Theology in the Nineteenth Century. He does not attempt to reduce these texts to generic themes or to questions of Barth’s development, but instead he simply tries “to observe what happens when Barth reads” (p. 7). 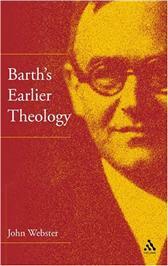 The result is a penetrating (and refreshingly generous) account, which positively bristles with new insights into Barth’s distinctive manner of practising history, his profound engagement with the Reformed tradition, and the ways in which his later theology remained stamped by those formative years as Professor of Reformed Theology at Göttingen (1921-25).